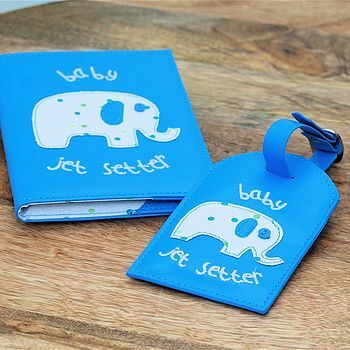 This fantastic Baby Jet Setter Gift Set contains an embroidered silk lined passport holder and luggage label. 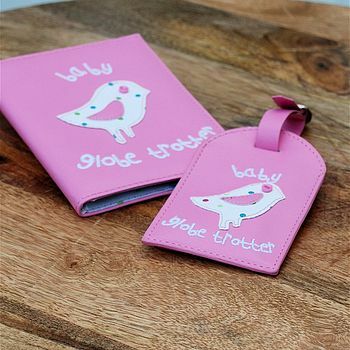 Available in the colors and styles Blue Spotty Elephant or Pink Birdy Design.Each passport holder is beautifully lined in silk spotty detail. The luggage tag has a hidden window for your baby’s name and address plus an adjustable strap to suit the length of your choice. Fits standard UK passport size and comes presented in a sweet polka design gift box. Made from faux leather with cotton lining. Sizes : Passport holder H14cm x 10cm when closed, Luggage label H12cm x 7cm.